The Standard Model of strong, electromagnetic and weak interactions is the crowning achievement of twentieth century physics. However, despite its many spectacular successes, the Standard Model is inconsistent at high energies and should be superseded by a new, more fundamental theory at the teraelectron-volt (TeV) energy scale. Many theoretical ideas about the nature of the physics at the TeV scale have been proposed, examples include: supersymmetry, extra dimensions of space and new strong interactions. Members of the Cornell theory group are active in investigating these ideas. 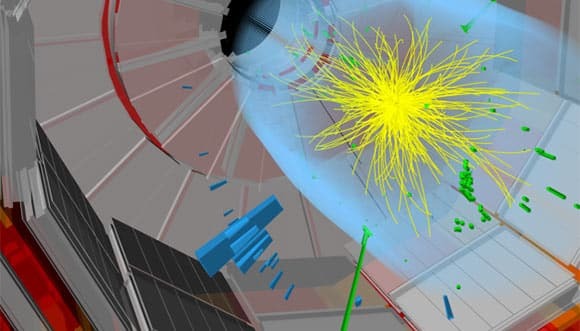 While so far this work has been purely theoretical, the experimental investigation of the TeV scale began in late 2009, when the Large Hadron Collider (LHC) at the CERN laboratory in Switzerland began operations. Theoretical interpretation of the LHC data is expected to be a major focus of research in the next few years. In this work, Cornell theorists will benefit from traditionally close connections with the LEPP experimental group, which is participating in the CMS experiment at the LHC. Two major experimental efforts presently underway are the study of the weak decays of B mesons and the mixings of neutrinos. The aim of this “flavor physics” is to explore the phenomenon of CP violation, to test the Standard Model and to search for new physics. Cornell theorists develop theoretical tools that make it possible to interpret the data from such experiments, and use the experimental results to build and test models of the baryon asymmetry of the Universe. Another research area actively pursued at Cornell is superstring theory, the only known theory to incorporate gravity and quantum mechanics in a unified self-consistent framework. At the moment, research is mainly focused on the “brane world”. In the brane world picture, the standard model particles are confined to a 3+1 dimensional subspace (the “brane”) of a higher-dimensional space-time, while gravity can propagate in all dimensions. The main focus of research at Cornell is currently on using such models to find viable mechanisms of inflation via the interaction of branes, and to find experimentally testable implications of these scenarios for cosmology. Particle theory students at Cornell have the opportunity to explore a wide range of research areas, ranging from experiment-driven theory to highly mathematical analyses of supersymmetric field theories or quantum theories of gravity. There is also work at the interface between condensed matter physics and particle physics, where mathematical and numerical techniques from relativistic quantum field theory are adapted for use on condensed matter systems, and ideas from condensed matter physics are applied to quantum field theories. Work can be analytical, or it can be computational, as in numerical simulations of quantum chromodynamics and other quantum field theories—a research area invented at Cornell. The particle theory program is very flexible: it is easy for theory students to work in more than one area, and it is not unusual for a student to co-author papers with more than one professor during their graduate career. In addition, there is close collaboration with Cornell’s theoretical astrophysics group, focused on problems of common interest to particle physics and astrophysics/cosmology.